REDUCED FOR A QUICK SALE PLEASE!......This is about as perfect as you can get. 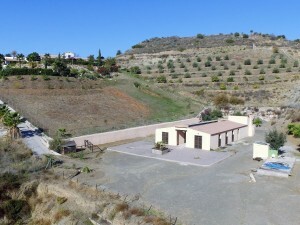 A lovely bungalow that is ready to move into and enjoy life in the popular village of Escoznar. It has everything - lovely fitted kitchen with woodburner; comfortable sitting room also with a brand new woodburner; 2 double bedrooms plus a large modern bathroom and access to the property just off the quiet side street, into a charming hall. It also has an integral garage which could be easily converted into a 3rd bedroom with ensuite bathroom. From the kitchen you step into a cosy dining room. Out the back of the property is a very private patio with room for a plunge pool / jacuzzi. Off this is another fully fitted kitchen, plus a separate utility area. From the patio steps take you up to a covered terrace with storeroom off. This could also be made into more accommodation. It has aircon throughout. The property is in a side street with open fields at the end, so no traffic and peaceful. The village has many amenities and is just 25 mins from Granada.